La Mirada Theatre for the Performing Arts and McCoy Rigby Entertainment presents their first-ever World Premiere musical and the fourth show of their 2014-2015 season, the runaway hit of the New York Musical Theatre Festival, JANE AUSTEN'S PRIDE AND PREJUDICE A Musical, with music, lyrics and book by Lindsay Warren Baker & Amanda Jacobs, based on the novel "Pride and Prejudice" by Jane Austen, with music direction by Timothy Splain, choreography by Jeffry Denman, and directed by Igor Goldin. JANE AUSTEN'S PRIDE AND PREJUDICE A Musical opens tonight, April 18 and runs through Sunday, May 10, 2015 at La Mirada Theatre for the Performing Arts, 14900 La Mirada Blvd in La Mirada. JANE AUSTEN'S PRIDE AND PREJUDICE springs to life when the author re-imagines the world of her novel. As the compelling love story of Elizabeth Bennet and Fitzwilliam Darcy unfolds, Austen learns to see both the story and herself in a new light. 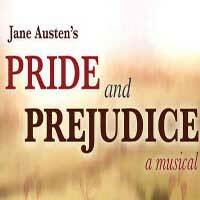 JANE AUSTEN'S PRIDE AND PREJUDICE A Musical will preview on Friday, April 17, 2015 (with a press opening on Saturday, April 18) and run through Sunday, May 10. Performances will be 7:30pm on Wednesdays & Thursdays; 8pm on Fridays; 2pm and 8pm on Saturdays; and 2pm on Sundays. There will be no matinee performance on Saturday, April 18. Talkbacks with the cast and creative team will be on Wednesday, April 22 and Wednesday, May 6. Tickets range from $20 - $70 and can be purchased at La Mirada Theatre's website, www.lamiradatheatre.com or by calling the La Mirada Theatre Box Office at (562) 944-9801 or (714) 994-6310. Student, Senior and group discounts are available.